Did you know that 1 in 10 people are affected by dyslexia in the UK? Dyslexia is a hidden disability thought to affect more than 6 million people in the UK. It is the most common of the Specific Learning Difficulties (SpLDs). Dyslexia is usually hereditary. A person with dyslexia may mix up letters within words and words within sentences while reading. They may also have difficulty with spelling words correctly while writing; letter reversals are common. Dyslexia is described as a specific learning difficulty that primarily affects the skills involved in accurate and fluent word reading and spelling (Rose, 1999). This can impact on literacy development, maths, memory, organisation and sequencing skills. However, Dyslexia is not only about literacy, although weaknesses in literacy are often the most visible sign. Dyslexia affects the way information is processed, stored and retrieved, with problems of memory, speed of processing, time perception, organisation and sequencing. Some may also have difficulty navigating a route, left and right and compass directions. If you can’t learn to read, you can’t read to learn. Two or three children in every classroom struggle to learn to read and write. Many will progress well with good phonics (sound based) teaching but for those with more severe needs it is essential that they have access to specialist teaching. Currently many of these children do not get the help they need due to lack of trained specialist staff and their difficulties can go unnoticed or unexplained. 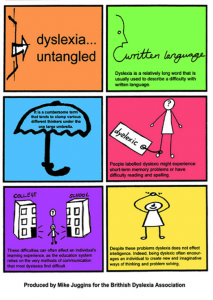 Without the correct identification and support, dyslexia can be a barrier to learning and can lead to school avoidance, exclusion, anti-social behaviour or depression. For children who struggle to learn, their behaviour and confidence can be badly affected.